HARRISBURG, Pa. — A bill that would have required Pennsylvania schools to post the motto ‘In God We Trust’ has been altered in the legislature to encourage schools to display the phrase, but not mandate its posting. Saccone, a Baptist, had also introduced a bill last year that honored the 150th anniversary of President Abraham Lincoln’s proclamation of a National Fast Day. The resolution overwhelmingly passed the Pennsylvania House 160 to 35, and was co-sponsored by over 25 representatives. He also noted that Francis Scott Key used the motto in the patriotic standard “The Star Spangled Banner” in 1814. In 1956, President Dwight Eisenhower officially declared the phrase to be the official motto of the United States and ordered that it be inscribed on all American currency. Saccone’s original bill would have required that a plaque or other artwork bearing the motto be posted in schools throughout the Commonwealth. But last week, the Pennsylvania House voted unanimously, 196-0, to change the text of the bill to state that schools “may” post the phrase, thus eliminating the mandate. The legislation also suggests that schools display the Bill of Rights adjacent to the motto. Even so, some groups remain in opposition to the proposal. The Pittsburgh Post-Gazette reports that the Pennsylvania ACLU asserts that if the bill becomes law, it could create legal problems for school officials. 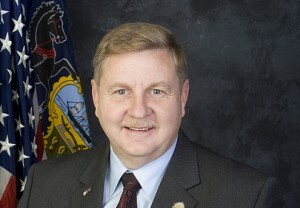 But Saccone, who recently authored the book God in Our Government, says that the motto’s rich history can’t be denied.